You probably don't realize it, but the same tricks used in grocery stores to entice you to spend more are used in showrooms for construction materials and products. In a grocery store, the sugary cereal is placed at childrens' eye level to grab their attention (and begin the begging process). The guilty-pleasure cereals that camouflage as healthier options are at adult eye level. And, the really healthy stuff? On the top or very bottom shelf, collecting dust. When you walk in a showroom, the most popular luxury goods will be front and center, and you will surely find yourself in "love" with some expensive (and probably trendy) goodies. With any construction material, the cost of labor must be included to determine the actual price difference. Labor rates can sometimes eclipse the unit cost savings. When selecting the backsplash for the kitchen at our Laurelhurst project, we immediately loved the classic look of the 1x3 statuary white marble herringbone pattern mosaic tile. But, at about $21 per square foot, the material cost was significantly more than a $4 per square foot matte white subway tile we also liked. We asked our general contractor to give us a total installed price for both options. Surprisingly, the additional labor to install the less expensive tile made Option 2 MORE expensive than Option 1. The labor to install each piece individually, plus additional time to determine the best layout in the field (to minimize small pieces), more than closed the price gap of the materials per square foot. This would not have been true if Option 1 also required piece-by-piece installation and fussy layout calculations in the field, but since the herringbone mosaic came mounted on a mesh in 12"x12" interlocking pieces, the labor factor was significantly less. Some materials have an even larger price difference between the material cost and the total installed cost. One reason is that some items must be purchased in certain increments, regardless of the amount needed -- such as certain tiles that are sold by the box and stones that are sold in whole slabs. When fragile or difficult to fabricate materials are being handled and shaped, there will also be a liability factor in the subcontractor's pricing. After all, if they break the slab, they will have to purchase and fabricate a replacement. 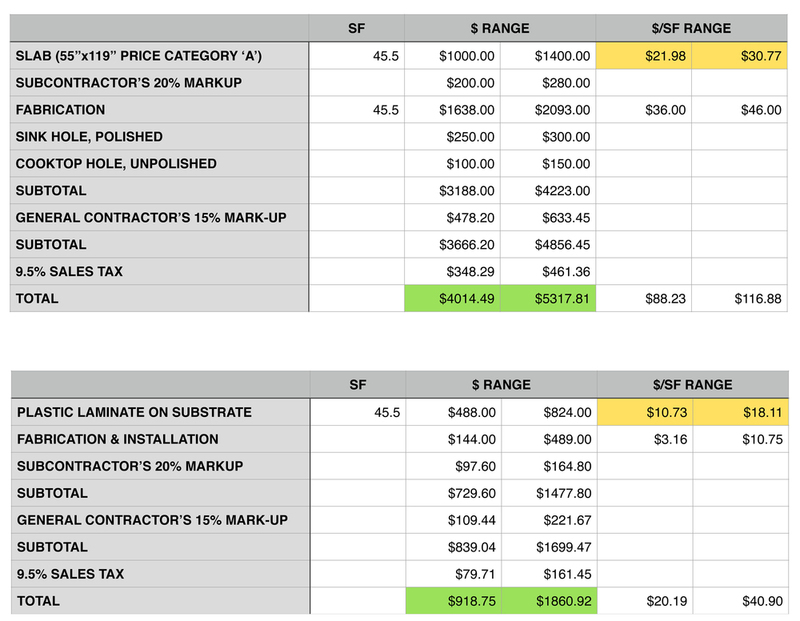 Upgrading to manufactured quartz from plastic laminate may seem like a small splurge if you rely upon square foot costs to make your judgment (see the yellow highlighted cells in the spreadsheet, below). However, once labor, fabrication, and mark-ups are added, the multiplier is much higher (green cells vs. yellow cells, below). You may also have to purchase more slabs because of the shapes of un-spliced pieces required that can be cut from a single slab. In contrast, plastic laminate can be continuously applied to a substrate in much longer pieces, so a purchase increment is less likely to trigger a significant overall price swing. Appointments are recommended (and required at many showrooms) so that you get individualized attention and answers to your questions, but you will have a true insider's advantage when your architect/designer is either by your side or has called to brief the salesperson regarding the design objectives and budget expectations before your appointment. If you find yourself captivated by a more expensive option, collect the information needed to price it, but spend time to find a less expensive option that would also work, keeping labor, purchase increments, and subcontractor liability in mind. According to Remodeling Magazine's Cost vs. Value Report for 2010-2011, a major kitchen remodel in Seattle is expected to yield a 59.7 - 66% immediate return on investment, while a minor kitchen remodel in Seattle is expected to yield a 72.8% - 84.1% return on investment. How do you decide whether to go major or keep it minor? If you are certain you will sell the house within 3 years, my suggestion is to keep it minor. If you spend only a few hours watching HGTV, you will quickly get the message that, in a buyer's eyes, updated finishes are more important than an ideal layout. So, why not keep that extra money you'd spend in your pocket? If you're planning to stay, or there is any likelihood that you will (such as conversations about moving "next year" that have gone on for more than 10 years), then I think it is wise to fix what is broken while you update finishes. You may need to improve the use of space, open it up to the adjacent room (or perhaps close it off), or move things around so that two cooks can comfortably work together. You may already know that you will live here well into your retirement years, and it would be wise to look at Universal Design features and dimensions that will make aging-in-place a more comfortable and safe experience. "How much should I budget for Construction Cost?" Unless you are not moving much of anything and are simply updating finishes, I wouldn't expect to be in the price range that this article quotes for a "minor kitchen remodel" ($21,695 - $23,603). Remember, these numbers are Construction Cost numbers (the amount you pay the general contractor), and they do not include "soft costs" such as permit fees, professional services (architect and/or engineer), reimbursable expenses, and a contingency fund (for unforeseen conditions that must be addressed - an unavoidable reality when remodeling). For soft costs, I suggest that you set aside 35% of your budget. Also, appliances, cabinet knobs/pulls, and decorative light fixtures are typically not included in the Construction Cost. The midrange numbers for a "major kitchen remodel" are more realistic, and even with that budget, you will have to make some very price-conscious choices. Appliance prices can go sky-high, and few clients are happy with the bargain-priced options. I typically see appliance purchases for a midrange kitchen remodel in the $8,000 - $12,000 range. Knobs and pulls can vary from $2.50 to $20+ each. The best-priced knobs and pulls are frequently found at "big box" stores, like Home Depot, Lowe's, and Target, or online. Be sure that you order more than you think you'll need. Finding out that something has been discontinued after the return-policy window has expired happens way too often! Decorative light fixtures can also be found at "big box" stores or online. You may find ceiling fixtures for $20 that will work in less important areas, or you may need something that is higher-quality where visual impact is important. A good working budget is $100/bulb. In other words, a dining room chandelier with 4 bulbs is probably going to be in the $400 range for a quality fixture from a store like Rejuvenation Hardware. "Okay, we're going for it. How do I know if my choices are on target for my budget?" Cabinets are one of the biggest homeowner-chosen line items, representing 30-35% of the Construction Cost. Working with the $60,000 Construction Cost budget above, that means $18,000 - $21,000 for the cabinet budget including the builder's mark-up (12-18%), sales tax (9.5% in Seattle) and installation (typically $2,500 - $3,000). Using the higher end of the range and 15% mark-up, that brings $21,000 down to about $13,500. If your cabinet package is more than that number, you need to re-evaluate your choices or adjust your budget. "Really? That seems like a LOT." Yes, really. Kitchens have a lot going on, with lots of different trades involved. Remember, next to "location, location, location," the kitchen is often what sells a house - and the difference between having a house sell quickly and having to carry the cost while it sits on the market is NOT factored into the return on investment equations. And, if you really don't care about resale value, then consider the fact that you will use your kitchen each and every day. In most homes, the kitchen is the hardest-working room of the house. Also see How Much Will My Project Cost?